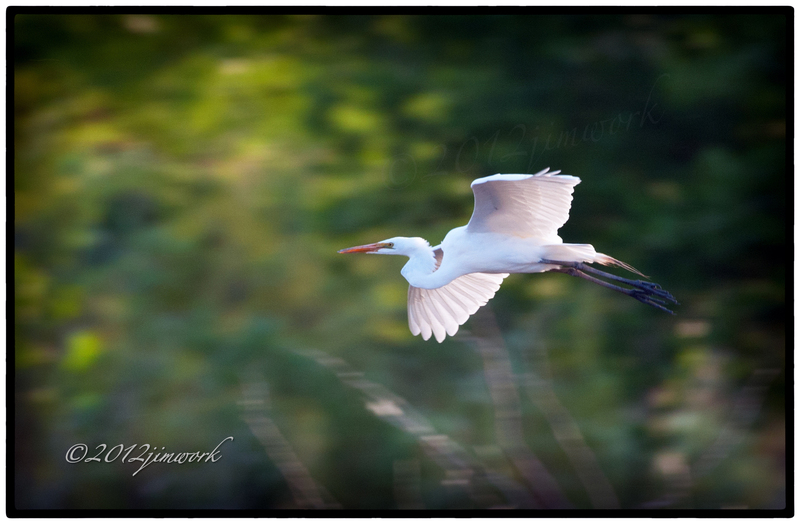 Great Egret (Ardea alba) in flight. The Great Egret is most certainly not the most graceful looking birds when taking off and landing. But let them get up to air speed, pulling that neck into an S to which even my second grade teacher Miss Kelly would give a silent nod of approval. They become a wonder of grace and poetry in motion. So it is a real treat to be in a quiet place yet close enough to hear the power of those wings creating the lift needed to carry their 2 pounds into flight. Watching their landings, you will likely find the quiet broken with your snort of laughter at seeing a small tree quake under their weight, accompanied by the squawks of their colony as they settle to roost.